How far is too far? Does art have limits? Boundaries of what’s acceptable? 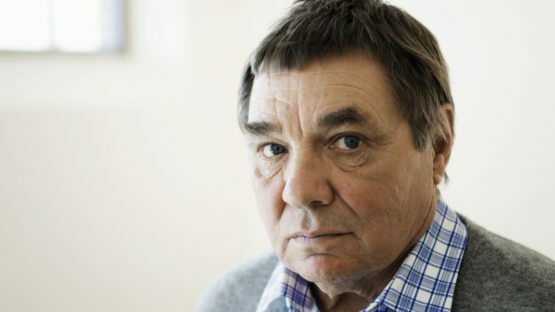 A radical and uncompromising figure with a fierce political consciousness, Chris Burden was an American artist who wasn’t afraid to take drastic steps. In his most dramatic performances, he was shot at – a gesture pointed towards all the meaningless of war, but also a powerful statement of a young, aspiring artist, who announced his coming to the world. Quite versatile, Burden eventually slowed down in his performance work, focusing instead on sculptures and installations, physical manifestations of his undisputed talent. Christopher Lee Burden was born in Boston and grew up in various places, like Massachusetts, Italy, and France. Originally famous for his performance art, particularly for his tendency to self-inflict pain while performing the artist probably got the idea for this type of work from a motorcycle accident he had when he was 12 and had to endure an emergency surgery on his foot without any anesthesia. He moved to California where he earned his B.F.A. from Pomona College in 1969, majoring in physics, visual arts, and architecture. Two years later he received his M.F.A. degree from the University of California, where he had been taught by some of the world’s famous artists, including Robert Irwin. Burden started performing while still in college. He had been known for his masochistic performances since the beginning of his artistic career. He loved the idea that he could express himself with only his body and motions, and with virtually no other materials. For some time, that had been the only way that he could express his artistic self, simply because he had no money. He did his first important performance act, Five Day Locker Piece, for his master thesis in 1971. He locked himself inside a locker for five days with no food, only a bucket of water above him, and an empty bucket below him for waste. Although nothing was visual about this piece, he had definitely drawn a lot of attention: first with his friends and then, as the word had spread, the rest of the campus. Since there had been nothing for him to do in the locker, he was talking to everyone outside of it. In the end, the act was so unorthodox that it even divided the university’s administration over granting Burden’s degree. The performance, however, was not mere sensationalism, grounded instead in a precocious understanding of fundamental shifts taking place in American art. He eventually became a professor at UCLA (1978), a position he had held until his resignation in 2005. The reason why he left the job was because of the controversy surrounding a stunt that a student of his pulled. Since the student was very influenced by Burden’s work, he brought a gun to a class and pretended to play Russian roulette. He then went out of the classroom and set off a firecracker. Everything was just a performance act that simulated his suicide, but Burden didn’t find this amusing whatsoever and criticized the piece, causing the people to call him a hypocrite. Burden was married to a fellow artist, Nancy Rubins. In late 2013, he was diagnosed with melanoma, which resulted in his death 18 months later, on May 10, 2015, at the age of 69. Arguably, his most famous piece is Shoot. The infamous performance took place in 1971 in f Space, a small gallery in Santa Ana, California, just a few doors from the artist’s own studio. There were only a few people in attendance, and all were performer’s friends. For the act, he had asked one of his friends to help him out by shooting at him with a .22 rifle from a 16 feet (about 5 meters) distance. The initial idea was to get only a graze wound on his left arm, but the shooter was off target, hitting Chris’ left arm. With this piece, Burden wanted to show the spectators what it is really like to be shot at in person, not on TV. The Shoot established Chris as a serious artist and gained him fame in the art world. Asked why he would even consider being shot at, he simply replied: “I wanted to be taken seriously as an artist”. Wanting to bring the pain closer to his viewers, the artist made it into the main motif of his work in the 1970s. Through the Night Softly seemed to be anything but soft. In 1973, Burden left his audience, mostly passersby, perplexed again by performing the piece: he removed his clothes and crawled across broken glass with his hands tied behind his back. The audience was shocked at the sight of his bloody, mutilated torso. And once again, he had managed to show hoe real the pain can be. 1974 was the year when Burden performed his most controversial and notorious piece, Trans-fixed, in Venice, California, where he posed as Christ. It involved a literal transfixion: Chris’ hands were nailed to the face of a Volkswagen. The car was then rolled out and shown to the audience, with the engine on full throttle representing the painful cries and screams of transfixed person experiences. Again, Burden reminded the people of the pain that we usually ignore. Burden performed another dangerous piece that same year called White Light/White Heat at the Ronald Feldman Gallery in New York. This piece was similar to his Five Day Locker Piece, only it was more dangerous. He again spent some time alone, isolated from people. Burden had spent 22 days in a corner of the gallery with no food and this time with absolutely no human contact at all. Another piece where Burden had put his life and health at risk, was Doomed, which took place at the Museum of Contemporary Art in Chicago in April of 1975. The experiment was set up so that it could show how ready we are and how far we would go when it comes to pushing the boundaries of physical endurance. Three items were involved in this piece: A huge glass plate, a clock, and the performer. He positioned himself beneath the glass and said that the piece would end the moment someone interferes with one of the items involved. The clock was there to track the duration of the piece. Afraid for his well-being, Dennis O’Shea, a member of the museum staff placed a container of water within Burden’s reach, thus breaking the rules of the piece and ending it only 45 hours after it had started. Burden got up, took a hammer and smashed the clock. Doomed unmasked the absurdity of the conventions by which, through assuming the role of viewers, we are both blocked and immunized from ethical responsibility. Because not many people could witness his early performances, they were captured on video and in words. Since the second half of the 70’s, Burden had started working on installations and sculptures, drawing from the knowledge of physics and architecture he had acquired during his training at the university. B-Car was a piece Burden created in 1975, displayed at Ronald Feldman Gallery in New York. B-Car, as Burden said, was a fully operational automobile that could reach the speed of 100 miles per hour. He made each piece of the car himself. DIECIMILA is a fine art print, arguably the first of its kind to be printed on both sides. For this artwork, Burden used a 10,000 Italian Lira banknote. Fascinated with technological innovations, Burden recreated John L. Baird’s original television in 1977. The idea behind this installation was that the transmission of a moving picture had been known to people for sixty years before it became reality. Unlike today’s electronic television, the one Baird made was mechanical, which is what Burden wanted his audience to understand. Since technology is becoming more and more complex and convoluted, fewer people fathom the principles of how anything really works. Burden wanted to bring these principles closer to people. 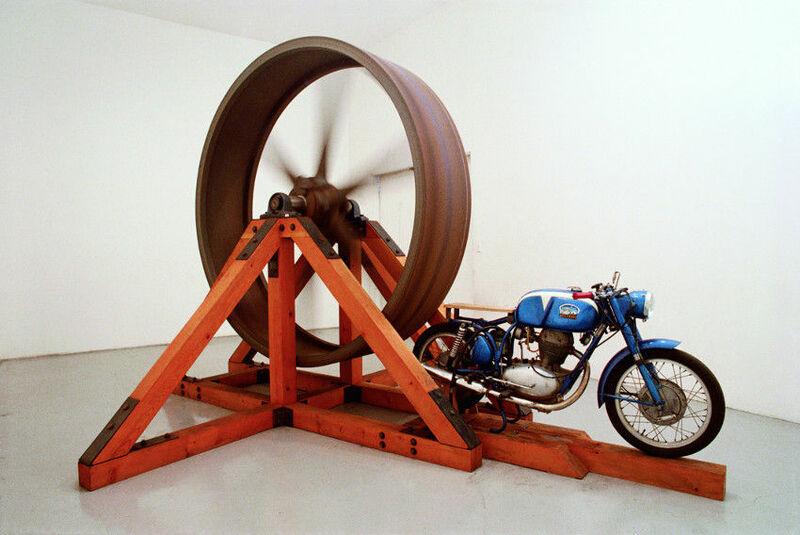 Two years later, Burden created The Big Wheel, a kinetic sculpture in which a motorcycle engine sets a huge iron wheel in motion, thus conveying and storing the energy. One could argue (and probably be right) that political circumstances had influenced Burden’s art to a certain extent. This was clearly visible in his Atomic Alphabet, a print created in 1980. It involves all 26 letters of the English alphabet running down the print, with a word written next to each letter, representing a concept or an object related to war and/or destruction. The piece alludes to the Cold War paranoia and the Vietnam War. Burden’s later works usually include huge installations and sculptures made of small parts, which were usually inspired by war and military. 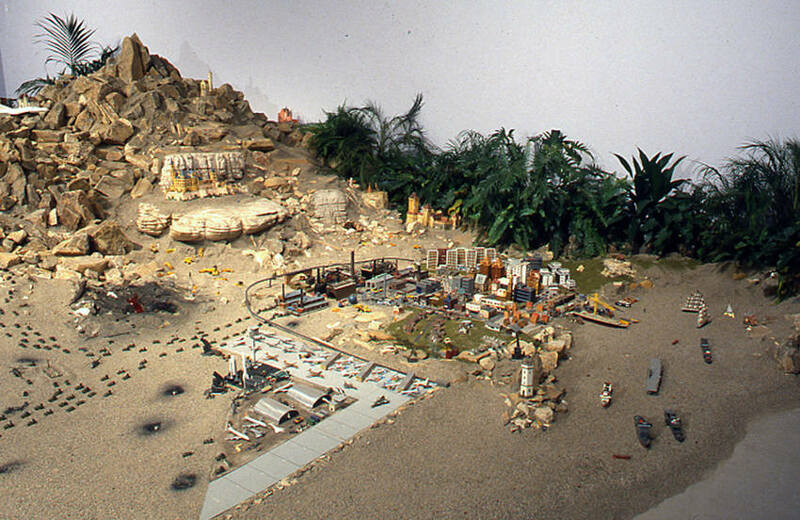 A Tale of Two Cities first came to be in 1981, as a product of Burden’s fascination with war toys like soldiers, model buildings, and bullets. It also represents Burden’s futuristic idea of the world’s society. He argued that the twenty-fifth-century-world would eventually go back to a feudal-states system. The installation actually represents two such cities waging war. At the same time, Tale of Two Cities is an elaborate children’s game and a sophisticated commentary on the absurdity of war. As society moves from the era of the Cold War to a time dominated by ongoing battles between neighboring nations and conflicts within a single nation, A Tale of Two Cities becomes uncannily prophetic. Similarly influenced was the installation All the Submarines of the United States of America from 1987. It comprises 625 small identical submarines, all of which were handmade by Burden himself. He hung them from the ceiling of a gallery at different heights so that they would appear as a school of fish. The submarine models represent the 1890’s submarines that became a part of US Navy in the late 19th century. Fast forward to the 21st century, Burden still managed to leave his audience speechless, though now there was no self-inflicted pain. Ghost Ship was a project launched in 2005. A small boat with self-navigation and no crew set off from Fair Isle, Scotland and made its way to Newcastle upon Tyne. 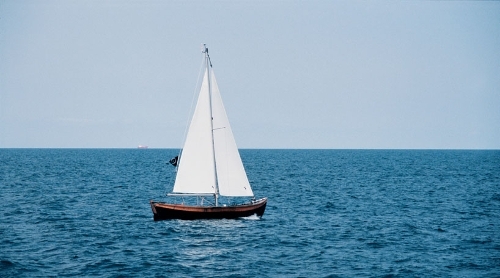 The 30-foot handmade vessel was controlled via GPS system. The project was commissioned by Locus+, an agency working with artists on the production and presentation of socially engaged, collaborative and temporary projects. Since the outdoor installation of Urban Lighting LA in 2008, it has become one of the contemporary artistic symbols of the city and has rendered the sculptor even more famous. Comprised of 202 iron street lights, the structure resembles the Ancient Greek temples, which was the initial idea of the author. The lamps are of various sizes, from about 20 to 30 feet, and they used to light the streets of South California in 1920’s and 1930’s. They are eco-friendly, solar lights, which switch on at night. The installation is now located in front of the Los Angeles County Museum of Art. Burden took his architectural skills to a higher level by creating Metropolis II in 2011. It’s an impressive kinetic installation where 1,100 toy cars whiz through the network of 18 tracks. The installation of the futuristic city took Burden over four years to create and engineer. The mini cars are going at a scale speed of 240 mph. The sculpture is now exhibited at the Los Angeles County Museum of Art. Metropolis II was the last important piece done by Chris Burden. In 2016, a video documentary came out, showing times when Burden was risking his life, but also times when his work evolved and became sculpture and installation-oriented. It also depicts other artists influenced by Burdens’ work, such as Marina Abramovic, Vito Acconci, and Carolee Schneemann. He forced the viewers to redefine their usually narrow and outmoded definitions of art and will be forever remembered as someone who pushed the boundaries of what was acceptable. The artist was one of the most responsible ones for proving that art does not have to result in an object, focusing instead on legitimate artistic experiences. He is represented by Kunzt gallery and Gagosian gallery. 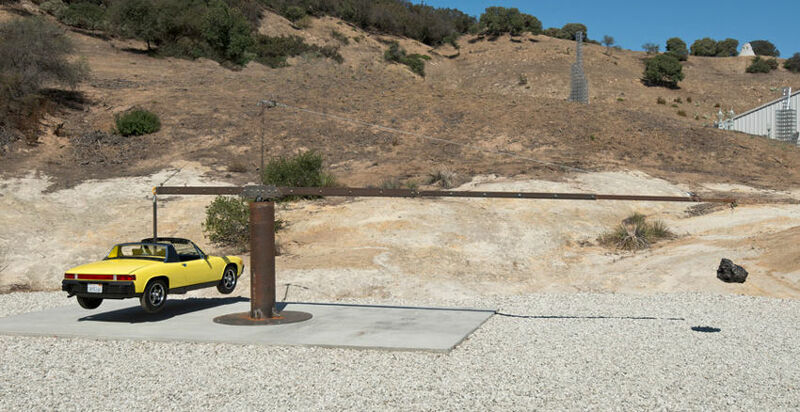 Chris Burden lived and worked in Topanga Canyon, California.